This package contains our enhanced 6 week EDTA System Cleanse of Cardio Renew plus 1 bottle of the Cardio Renew Vitamins C & E Soft-Gels. You must wait at least 1 hour between each dose . Doses can be taken once every hour or spread throughout the day. Always wait 3 hours after taking any medication before taking Cardio Renew . Wait 2 hours after taking other Supplements. Wait 1 hour after taking a dose of Cardio Renew before taking any medications, supplements, food or consuming alcohol. Do not take Supplements containing Minerals (eg. calcium, magnesium, potassium, iron, etc. ), including Multi-Vitamins (that contain Minerals) All Vitamins (eg. B, D, A, etc.) are fine to take. Take doses on an empty stomach . When possible, wait 2 hours after eating a complete meal. For snacks, wait 30 minutes. Wait 10 minutes before and after taking a dose of Cardio Renew before drinking any additional liquids. We recommend at least 1,000 mg of Vitamin C & 1,000 IU of Vitamin E daily . We suggest the Vitamins be taken with meals. If using Cardio Renew's C&E Soft-Gels , take 1 soft-gel, 3 times each day with a meal. Drink 6 - 8 glasses of water each day . Tap water is fine. ** After completing the 6 week System Cleanse, take a daily Multi-Vitamin / Mineral supplement for at least 1 week before starting a Maintenance System or repeating the 6 week System. Do NOT use if you have Liver or Kidney disease or any condition affecting blood cells or the immune system. Do NOT use if you are Pregnant or Nursing. Cardio Renew is highly concentrated. You MUST mix Cardio Renew with 2 ounces of a mineral free liquid. Avoid direct contact with eyes, flush immediately with water if direct contact does occur. 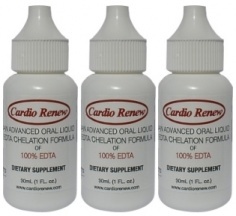 Because Cardio Renew's EDTA formula is Sodium based, people that are extremely sensitive to Sodium (i.e. salt) should monitor their blood pressure during the Program. Cardio Renew is NOT intended for use by children. Please review our disclaimer.